The Las Vegas Aladdin was one of the old hotels of Vegas, and had been around on the strip in one form or another since 1966. If anything represents the excesses and the high stakes of Vegas, its the Aladdin: continued expansion leading to a huge sprawling hotel that covered 36 acres; mob involvement; implosion in 1998; $1.4 billion rebuild in 2000, closely followed by bankruptcy when the new look Aladdin, complete with 2,600 rooms and an entire mile of shopping within its walls, was simply ignored by the passing public! The Aladdin was rescued and so continued trading, but since 2007, it’s been turned into Planet Hollywood. It’s still the same building underneath, but it looks completely different from the outside. 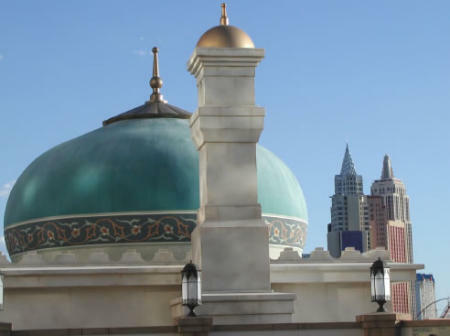 So if you go to Vegas now, you’ll see barely a trace of the Arab-themed splendour that was the Aladdin, which was possibly the Strip’s biggest white elephant. To give you a taste of what it was like, I’ve added a few new photos of the Aladdin as it was to the Gallery, courtesy of Susan Jancso, a prolific writer, photographer and lover of Las Vegas. Susan will shortly be publishing a book on Las Vegas, and can be reached at mailto://amhirlap@sbcglobal.net if you want to find out more. The pictures of The Aladdin can be found under a new section of the gallery called Old Vegas, which I’ll be adding to over the coming weeks. I also have tonnes of new reviews to add, as I’ve just returned from yet another Vegas visit, so stay tuned! Thanks Mike! You made the changes just as I requested. You are doing such a great job with this website!